This preamble of mine to the photos shared of vanishing indigenous people of our world is meant to give some background to the fact that during the excesses of Mao’s Great Proletarian Cultural Revolution, 1966-76, the National Minority People throughout China, though going thru the same turmoil and upheaval as the rest of the country, were the only Chinese People allowed to keep their own National dress, jewelry (lots of silver) and customs. Many times the only way of distinguishing one minority group from another was from their distinctive dress and bling! Although I took many photos of the people, it was not my focus during this unprecedented opportunity of discovery (and unfortunately many I did take have been lost or destroyed in the years since, in addition I definitely had not the artistic acumen and ability of this photo artist!). But I did get to see many indigenous, tribal people in China, some in urban settings mingling with the monochrome colors and unisex style of the majority people in their multicolored and infinitely varied hats, bags and other accouterments. It was very jarring and otherworldly experience, being mainly in a monochrome culture at the time, and brought to mind a glimpse of what the mingling of Indian tribes, soldiers, cowboys and all the many and diverse people thrown together in our Far West of our mountains and Great Plains in the 19th Century! * One other unexpected side effect of the singular dress; being in the PLA, work in the fields, department store, office or hospital was no longer looking at these things to assess an individual. You only had the face to examine. It became clearer immediately that the individual was solely judged by facial recognition, no other distractions interfered. The faces would have been a great photo exploration allowed of the China of that time ! Later it reminded me of the Qing Di terra-cotta army buried in Xian where each individual face is immediately recognized in the singular uniform and grey/brown earth color of the clay. Arriving home Monday early evening after an all day surgical procedure at a state-of-art Sandhills N.C. Medical Facility, and thru a prematurely darken sky dumping Monsoon-like torrents of rain over the 60 mile harrowing ride, I open iPad to discover a conspiracy between Mrs. Ma and #1 Violet bringing me face-to-face with an old photo of an 18 year old Jarhead-wannabe in Marine Dress Blues complete with teenage zit where grows the past 45 years a treasured imperial beard of, as many people have been pointing out, a silver grey color! Now, had I been appraised of the conspiracy, the photo posted of my and my faithful companion “Kawasaki” (referring to the village some of which can be seen beyond the motor pool fence), the 3/4 ton truck, would have been my choice. The main difference of life 60 years in the past is the absence of cell phones and the daily photo people take today of themselves, their pets, plates of food, children and myriad grand children, rocks at their feet, cloud formations above, and martial art classes showing the same people in same pose but perhaps different outfits; all the photos I take today. Few were taken then, fewer survived. 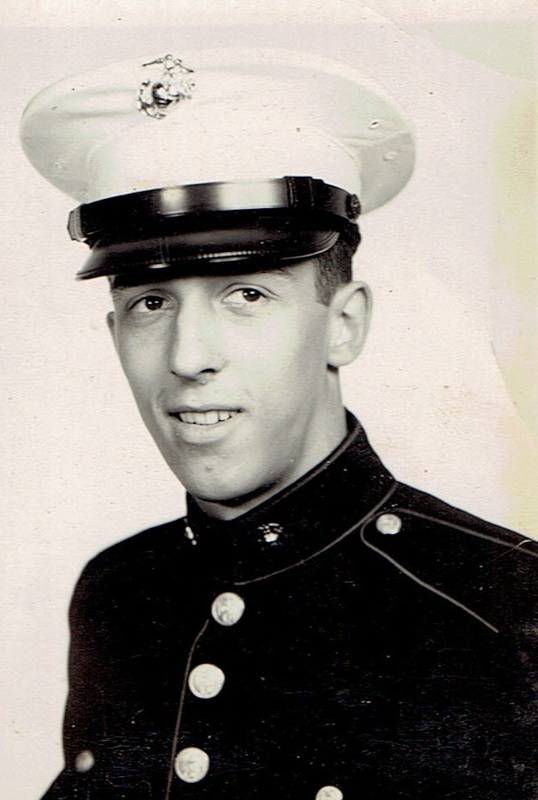 So, before I get to Beloved truck “Kawasaki,” and Okinawan escapades here’s a bit of background of the dumb kid in the Dress Blues. 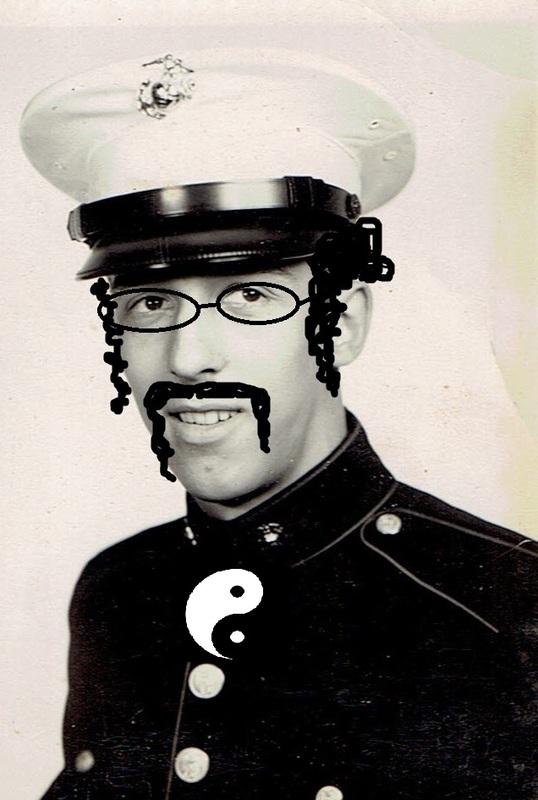 Before touching the only other photo I have of my 5 year enlistment, another photo of me in the Dress Blues shot has just surfaced, of a very handsome Hasidic Rabbi, doctored I may add. I must say I agree with Rich Martins response: “THIS IS JUST WRONG!” But funny as all hell ... and I can’t stop laughing! Laughs that are just, if I may add, what is needed in these days! I will have to write about L/Cpl A.R. 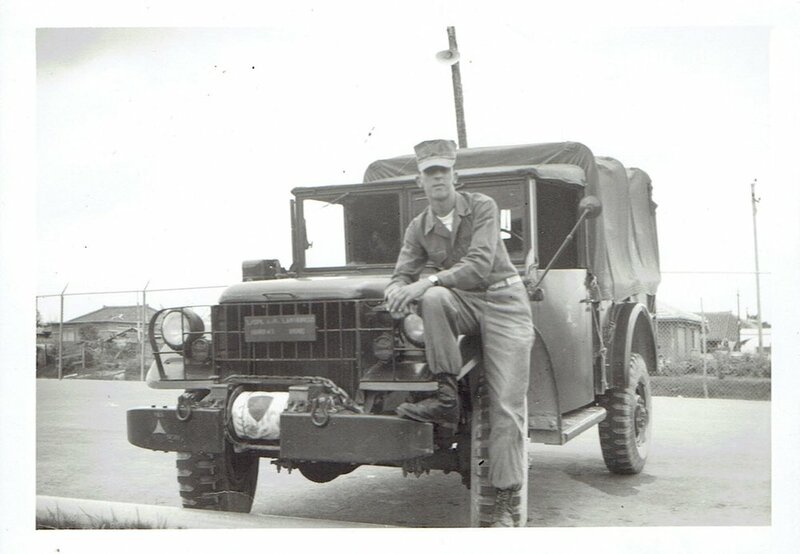 “Frenchy” Lamoureux and his beloved 3/4 ton personnel carrier pick-up truck (only vehicle smaller was a Jeep!). FB just might penalize me for excessive wordage here as it is...so let me close this apology! The New Yorker recently had an article about a small farmer who put a visual taste of her live online daily. It is a fascinating look into contemporary Chinese life interacting and being changed by the internet. My how things have changed from LaoMa’s time in China! We can see things moving forward before our eyes! English translation - providing you with the challenge of using those two to find the character! Here’s a taste of the first bit of the article. Click on the picture or HERE to read the whole story. For those of you unable to make the party this Saturday, we thought we'd share the most popular attraction - Selden traditionally creates unique lyrics to a popular tune and enchants us all with a song for LaoMa. This year it was set to the tune :77 Sunset Strip! Happy birthday to The Ma!!! May you have many more! YeYe’s 91st Birthday Celebration! Banquet! 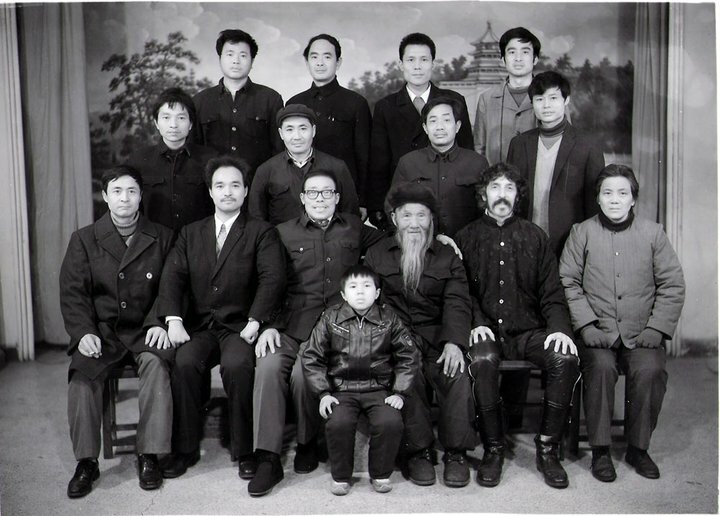 This photo was taken some four months after I had been accepted (through a harrowing audition in front of hundreds of outdoor martial artists) into the Snake Hill Wushu School of 90 year old Ding Hongkui, respectfully called by one and all simply as “Grandfather Ding,” or “Ding YeYe.” This audition and acceptance took place in a bewildering, magical set of occurrences within 3 days of my arrival to Wuhan, Wuchang to begin teaching “Native English” at a specialized university. 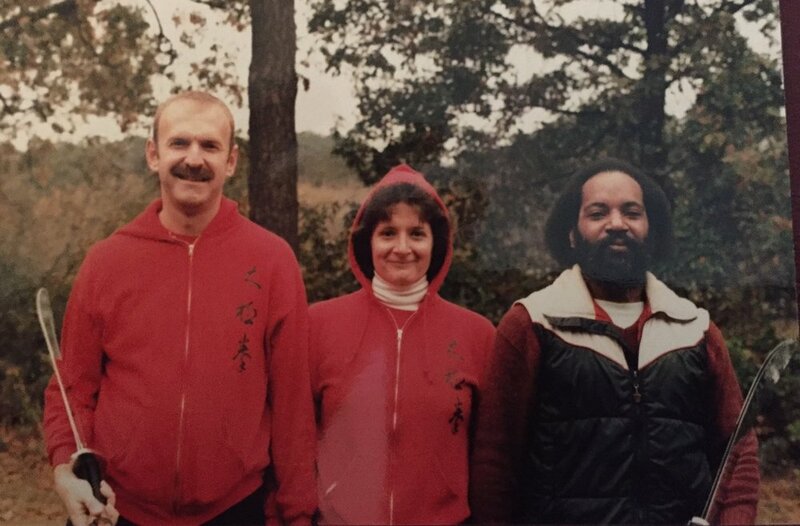 And thus began the realization of a long-held, 20 year dream-come-true of training in mountain temples, mist-covered mountain pathways, and white bearded venerable Master of Daoist/Taoist lost arts! YeYe’s 91st Birthday Celebration! Banquet! The photo’s setting was in Wuchang’s newest Taiwan-style restaurant, a traditional Chinese restaurant with “western” touches of Taiwan and Hong Kong establishments. We were at the top of the 4th floor building in two large banquet halls of 10 round tables each sitting 10 revelers a piece. The guests were a mix of martial artists and people from the folk and government medical world, many of the latter sharing the love and training of the former. My awareness of my acceptance, status and title in his school began at this round table. Not only was I invited to sit among all the senior and more deserving students, and other very honored guests (and completely out of my class and rank; little more than a talking monkey! ), but I was seated at the honored position to Ye’s left with the important function of keeping his wine cup always filled. I imbibed at the time in alcoholic drinks, but refrained from such this night for fear I’d blow the job! In this photo we are probably on our second bottle, and there is little indication, other than in his eyes, of any alcoholic effect on him whatsoever! What a 91st Birthday this was! Starting tomorrow, my 77th, I have 14 years to wait for mine. I am striving to reach that milestone! This photo however, really marks the date of my Dream-Come-True. For it was knowing I was there and in that chair at his insistence that I knew this magical experience for me was reciprocated with a similar one for him. I, a talking monkey, came into his life (YeYe taught in this Pavilion thru war and Revolution, destruction and civil chaos for 60 years) during his last year on earth’s Middle Kingdom, and then along comes this foreign enigma (to my question, did he ever meet a foreigner -Wei Guo Ren- before he replied no, then paused a bit and said, “yes, I met Japanese soldiers once”) with which he had to rely on very different approaches to teach. He had a final challenge to do what he loved and what his life was centered around. I am hoping for that challenge to come my way sometimes before the end of the 2020’s! Chef Zheng in addition to his cooking duties also pulled double duty as guesthouse gatekeeper. 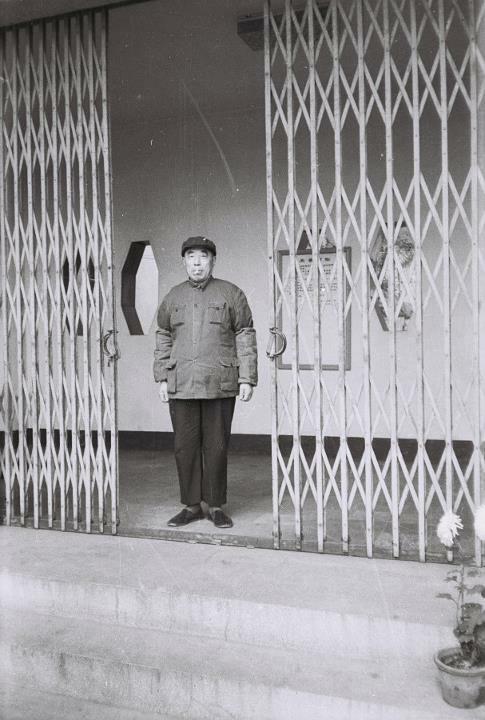 Gatekeepers throughout China are the most important of all job descriptions, as they determine when a foreign devil, for instance, can safely and comfortably exit, after about 9:00 p.m., and reenter, around 5:00 a.m., the living quarters. A gatekeeper deserves vast amounts of guanxi...if one wishes to roam around and explore the city's nightlife. Lao Zheng was the first Chinese to meet and greet me in my new home, a converted Buddhist WWII MilitaryTemple to Cai Da’s guest house and special meeting room, and my home for the first two years of an idyllic sojourn. I arrived mid-morning from Beijing train with severe jet lag exhausting me, and biological clock 12 hours ahead. A knock on my room’s door, I stagger to open it and there’s this short man holing a humongous platter of food! My stomach turns over in disgust and rejection and I pantomime I’m not only not hungry, but the huge pile of food is turning my gut over. He looks startled and scurries away. He’s back at the door, I open and he’s standing with hopeful grin and ... bigger patter of food! I learn later that in general Chinese think we Western Foreign Big Nose people are used to eating gargantuan piles of food!! I learned later he thought I was rejecting the first platter for a second larger one!! Lao Zheng was a tremendously excellent and talented cook. 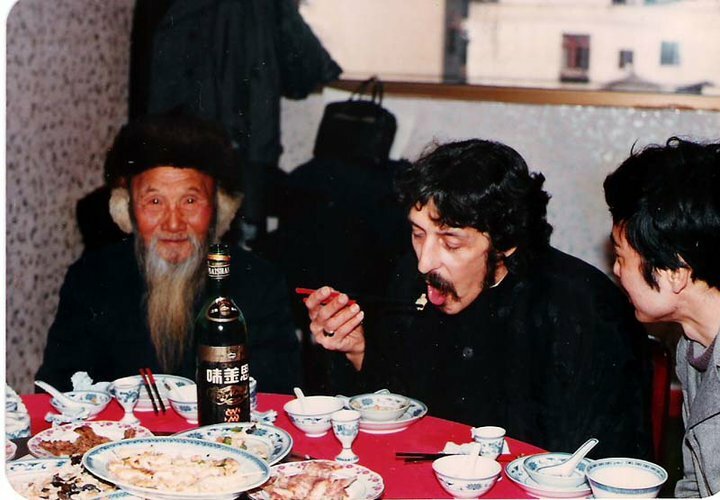 He had just returned from an Chinese Embassy gig in Paris and my only other house mate, Mary, and I were honored to have, while in China, some of the most exquisite French cuisine offered by this extraordinary Chinese/French chef! Hao Gong Fu, Lao Zheng! This is only stretching or "warm-ups" I ever saw. Taiji group in background. YeYe 1985-1. August, Year of the Ox. YeYe 1985-1. August, Year of the Ox. First photo I took of Ding Hongkui as I was being led by the Pavilion on my first trip to Snake Hill. I was so impressed with this man. Three days later he accepted me in his school as first foreign student in 60 years of teaching at Snake Hill Pavilion. Though known, respected and admired throughout China (as I was to discover over and over in my travels carrying his photos) for his Wushu expertise and overall reputation in Chinese Martial Arts, he was addressed simply as YeYe, or Grandfather. Ding YeYe's special knowledge concerned the Tang System and in this photo he was teaching Bagua Jian, the straight sword form of this system. 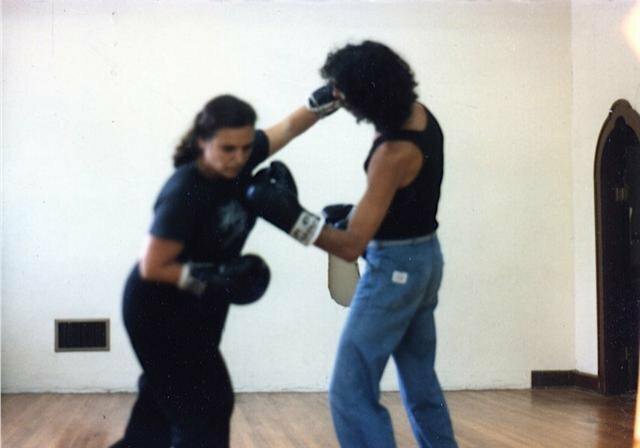 Although I initially thought I would be studying taijiquan only, when I arrived for my first class (at 5:00 a.m.) I joined this class and began studying this waigong sword form. It was the first of some 30 forms I learned during this sojourn. On a visit maybe five years or more ago, Debra and I walked Mongo thru my wilderness wonderland (now scheduled for the axe of gentry development called Chatham Park where the wild will succumb to unimaginable hordes of the 1% enlarging the town I've called home for a quarter century from 6,000 souls to 60,000! Selden and I with Mongo and so many friends have had 12 magical years of exploring this Haw River experience, it's hard to have any regrets, plus I'll be dead and dust before the new Utopia is completed!) with the trails she chose, we broke, I maintained. We stopped at one of our many rest stops we call Banana Tree Station. A green bucket with yin/yang and USMC decals stuck to its sides is the only comfort piece of this facility. *Note: The poem below is by Debra Dean, a long time senior student of LaoMa's. It was published in One, an online journal! (http://one.jacarpress.com/) The poem is placed towards the end, but it should be noted that according the editor, this issue is meant to be read "cover to cover" like a book. In a recent Facebook post, Debra included the two pictures of the tree as well. If you look closely, you can spot the willow effect. It's most visible in the first photo and shows as a slanting dark diagonal line in the top right corner. You can also see the bucket! Some photos, taken by and shared by London taiji shimei Lia, on the Second Annual Lantern Festival held in west London's Chiswick Garden Park. When I first looked at these beautiful photos I thought they were the size of those I remembered seeing during my three Lantern Festivals in China, that were festooned in mountain park trees, but the silhouettes of people in one photo (the swan below) show the huge size of these London displays! These festivals are linked together in China in a way a lot of foreigners are unaware of. I was privileged to experience 3 of these "Holidays" while living in Wuhan, Wuchang, Hubei Province. Of the three Chun Jie 春 節! or Spring Festival (what we in the West call Chinese New Year) I spent one of these years in Hong Kong when it was still a British Colony, the other two in Wuchang, but I participated in all three Lantern Festivals 元宵節! with friends and Wuchang, Snake Hill Pavilion classmates. Lantern Festival cannot be mentioned without considering Spring Festival. The Big One! The Mother of all Chinese holidays! If you take Easter, our Spring Festival, with its new clothes, new spring flowers; New Year with its alcohol celebration and year-changing rituals; Christmas with its family traveling and gift giving; Thanksgiving with its special food dishes and family meal; throw in 4th of July with unlimited fireworks, mix them all together for 2 to 3 weeks of raucous noise and gunpowder scented streets, a replacement of an annual animal totem and---you have a glimpse of Chinese Spring Festival, or Chun Jie! Our concept of a one night new year out on the town just doesn't quite fit the bill. But then comes Lantern Festival...! The spectacle of Chun Jie, with its weeks long celebration, incessant fireworks, accompanied by bottle rocket and firecracker injuries to adults and, way too many, young children (my one Spring Festival attendance in Hong Kong was quite different from that of the Mainland; personal fireworks were forbidden, and only prescribed to one government display from barges out in the Fragrant Harbour), and stressful travel with millions of travelers filling train and bus stations finally comes to a close. Fifteen days after the Lunar New Year, Lantern Festival brings the tumult of the preceding weeks of hectic celebration with a sedate wrap-up of surprising beauty, grace and neighborly interaction. Families stroll through the streets carrying candle-lit, birdcage sized lanterns held aloft, greeting one another as the processions wind their way toward a neighborhood park, in my case toward Snake Hill where we met in early mornings in the tiered wushu training areas, to hang the lanterns upon tree branches festooning the paths and sinuous ridge of Sheshan 蛇山, in a gentle glow of swaying colored lights. A quite magical and breath-taking ritual.